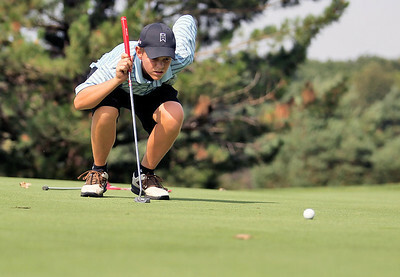 The MCJGA Prairie Isle Open was held in Prairie Grove on Wednesday, July 25, 2012. 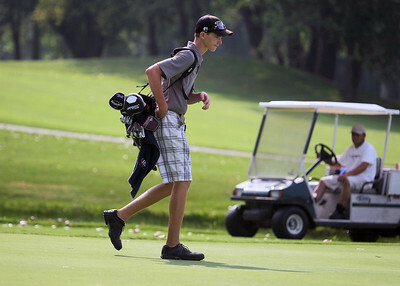 Sarah Nader - snader@shawmedia.com Hunter Simonini, 15, of Marengo walks to the next hole during the McHenry County Junior Golf Association's Prairie Isle Open in Prairie Grove on Wednesday, July 25, 2012. Sarah Nader - snader@shawmedia.com Bailey Bostler, 16, of Lake in the Hills lines up her putt during the McHenry County Junior Golf Association's Prairie Isle Open in Prairie Grove on Wednesday, July 25, 2012. Sarah Nader - snader@shawmedia.com Brianna Digrazia, 16, of Crystal Lake lines up her putt during the McHenry County Junior Golf Association's Prairie Isle Open in Prairie Grove on Wednesday, July 25, 2012. Sarah Nader - snader@shawmedia.com Brandon Dahl, 14, of Lake in the Hills watches his shot during the McHenry County Junior Golf Association's Prairie Isle Open in Prairie Grove on Wednesday, July 25, 2012. Sarah Nader - snader@shawmedia.com Brianna Digrazia, 16, of Crystal Lake watches her shot during the McHenry County Junior Golf Association's Prairie Isle Open in Prairie Grove on Wednesday, July 25, 2012. 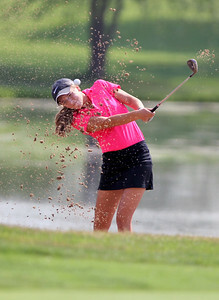 Sarah Nader - snader@shawmedia.com Bailey Bostler, 16, of Lake in the Hills hits out of a bunker on the 10th hole during the McHenry County Junior Golf Association's Prairie Isle Open in Prairie Grove on Wednesday, July 25, 2012. 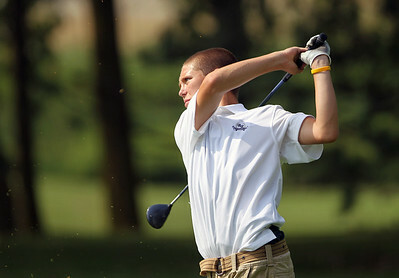 Sarah Nader - snader@shawmedia.com Hunter Simonini, 15, of Marengo watches his shot during the ninth hole of the McHenry County Junior Golf Association's Prairie Isle Open in Prairie Grove on Wednesday, July 25, 2012. Sarah Nader - snader@shawmedia.com Brandon Dahl (left), 14, of Lake in the Hills, Ben Harvel, 15, of Crystal Lake and Hunter Simonini. 15. of Marengo walk to the ninth hole during the McHenry County Junior Golf Association's Prairie Isle Open in Prairie Grove on Wednesday, July 25, 2012. 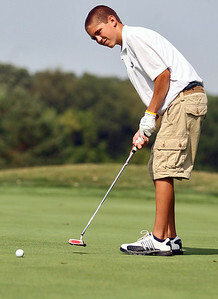 Sarah Nader - snader@shawmedia.com Brandon Dahl, 14, of Lake in the Hills watched his putt approach the eight hole during the McHenry County Junior Golf Association's Prairie Isle Open in Prairie Grove on Wednesday, July 25, 2012. Sarah Nader - snader@shawmedia.com Ben Harvel, 15, of Crystal Lake lines up his putt during the McHenry County Junior Golf Association's Prairie Isle Open in Prairie Grove on Wednesday, July 25, 2012. Sarah Nader - snader@shawmedia.com Larissa Luloff, 15, of Cary lines up her putt during the McHenry County Junior Golf Association's Prairie Isle Open in Prairie Grove on Wednesday, July 25, 2012. Brandon Dahl (left), 14, of Lake in the Hills, Ben Harvel, 15, of Crystal Lake and Hunter Simonini. 15. of Marengo walk to the ninth hole during the McHenry County Junior Golf Association's Prairie Isle Open in Prairie Grove on Wednesday, July 25, 2012.